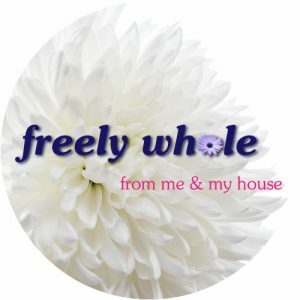 freely whole–from Me & My House ministries is primarily a ministry to women, and began as an outgrowth of my own discipleship through life. On this website, and in my resources, you will find discoveries I’ve made on my Journey. Some of those discoveries are Truths from God’s Word, some are practical home management tips, some are home education ideas, some are natural health resources. My desire is that, in my sharing them, they will help you find more Freedom & Simplicity™ in your life–as well as the only Way to eternal life through Jesus the Christ, if you have not put all your trust in Him yet. You’ll find my content and resource recommendations in the various sections of my website, linked in the sidebar. You can also connect with me through my various social media sites, linked in the header and footer of my website. Just a mom of many and child of the One True and Eternal Almighty God. Saved by God’s Grace Alone, through Faith Alone, because of Jesus the Christ’s finished work Alone, based on Scripture Alone, for the Glory of God Alone. Not that I have attained in any way, just the journey of my life thus far.